A few weeks ago I posted a flyer for one of our Becoming Financially Fit courses on a community Facebook page. Someone posted a reply in the form of a meme (for those who don’t know what memes are, they are a picture with a text overlay that is typically humorous, sarcastic or inspirational). 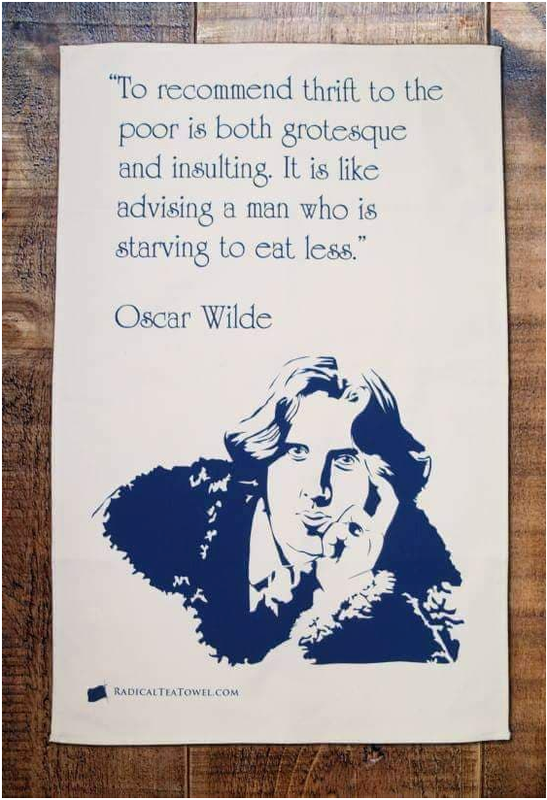 The meme stated “To recommend thrift to the poor is both grotesque and insulting. It is like advising a man who is starving to eat less – Oscar Wilde”. This had quite an impact on me as I have worked in the social service sector for many years off and on and have seen first-hand the impact that not having enough money to meet household expenses has on families. The cost of living has dramatically increased with rental costs doubling in the last 6 years and significant rises in the cost of electricity, petrol, and food. Annual rises in minimum wage entitlements have not kept pace with the rising cost of living, and increasingly household budgets are stretched to breaking point. For many, no ‘revised household budget’ will stretch the already stretched household income to meet rising weekly costs. As an organization we are focused on improving economic wellbeing in West Auckland. We do this through providing free and part fee programmes that either grow income or save money. Our Driver Education courses support the community to move through the graduated driver licence system stages which reduces the financial hardship that is created when people are fined and ticketed for driving outside of their licence conditions. A driver licence also open doors to employment as 70% of jobs listed on TradeMe require the applicant to have a driver licence, even if the job does not include driving. A quick scan of jobs requiring a driver licence include a deli employee at a supermarket, a grounds person at a retirement village, a nurse at a rest home and a chef at a restaurant. None of whom would need to drive as part of their job. Employers often use a driver licence as a litmus test of responsibility and online job applications often use a driver licence question as way to cull the number of applications. Other WEST courses focus on improving economic wellbeing by increasing skills and knowledge that will save money in the long term. WEST run beginners sewing classes that teach mending and alteration skills – a must have skill for any parent whose child wears a school uniform. At $30 for a pair of school shorts, being able to mend minor rips and tears saves money, especially for larger families whose school uniform costs each year often run into the thousands. Similarly learning how to grow fresh vegetables and make inexpensive meals using seasonal ingredients can have a real impact on the grocery bill each week. At WEST we are always looking for innovative course ideas that will grow income or save money. If you have a course you would like to deliver to the community please let us know. For more information about the workshops and courses WEST currently run please visit our course calendar webpage.